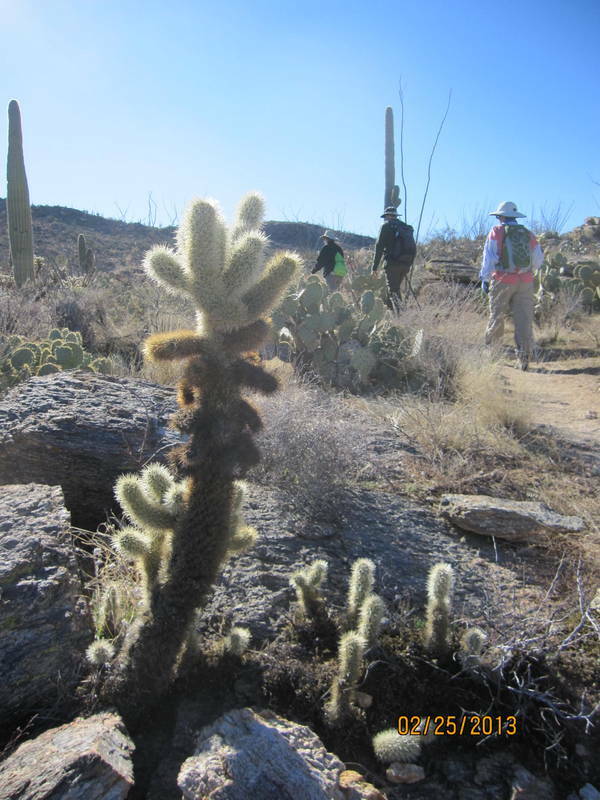 Our sedentary life was blown apart this week, as we hit the hiking trail Monday in Saguaro National Park with a group from our RV park. 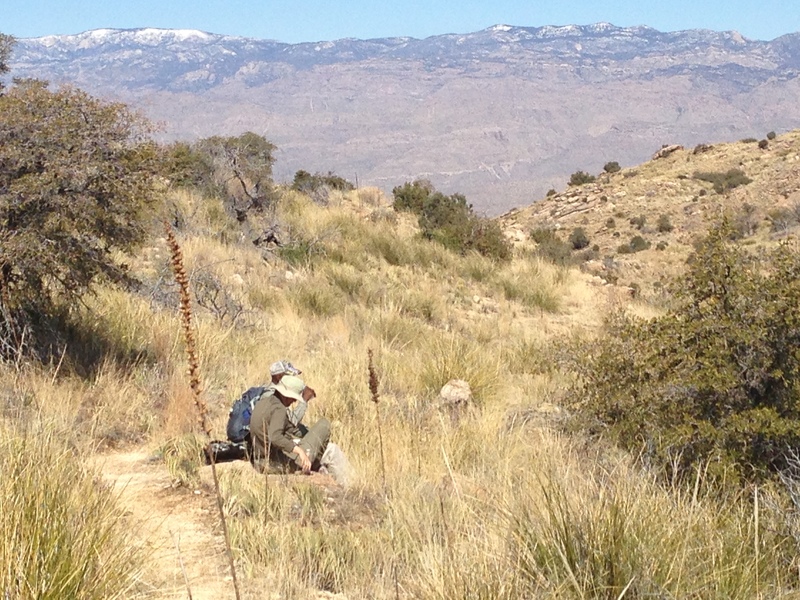 Our hike was in SNP East, which is on the Rincon Mountain side. It’s beautiful. Trail Map. We stopped short of the Juniper Basin. Twenty-two hikers set off on the hike, which was billed as 7-8 miles long, with a 700 foot elevation gain. Early in the hike, we’re still smiling. 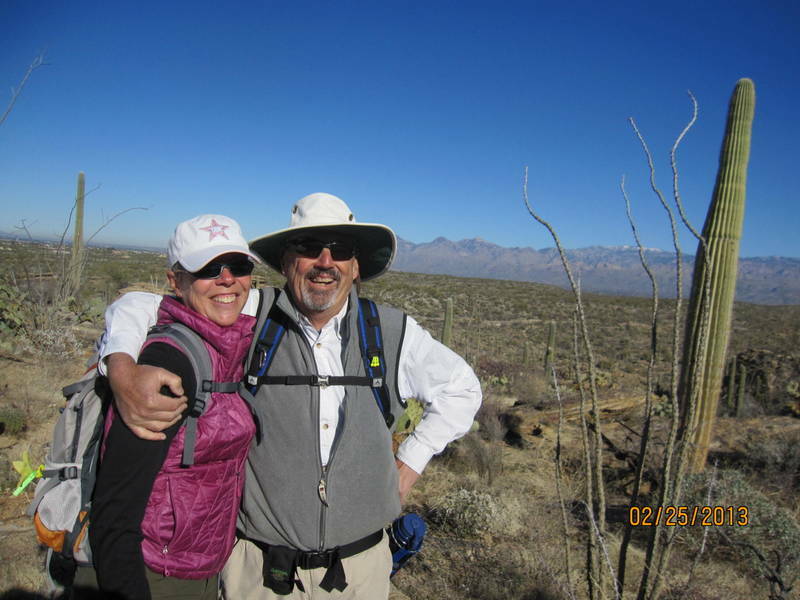 Our hike leaders, Sam and Sally, have impressive hiking credentials. They have cross-hiked the Grand Canyon in a single day several times – a 25 mile hike across and back. 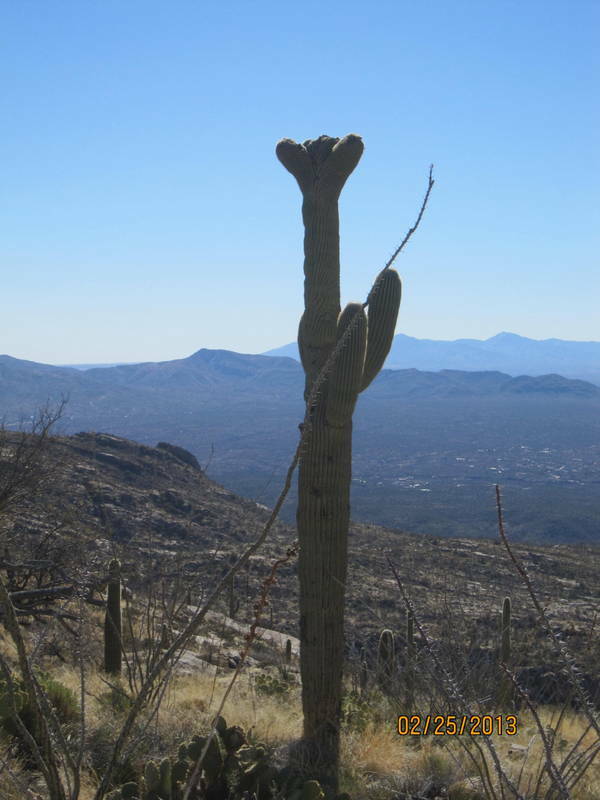 They’ve probably hiked every mountain and trail in the Tucson area. Sam’s a 75-year old ex-Marine. You get the picture. So, off we go, and immediately the trail points upward. Relentless. Not steep, but every step higher than the last one. After a mile or two, my quads and calves were starting to whine a bit. Every now and then, someone would ask Sam how much farther to the Saddle, which was our halfway point. He’d gesture and point over yonder hill, and off we’d go again. Finally we reach our lunch stop. a crested Saguaro near our lunch stop. The crown on the top is rare. You can see how high we’ve climbed. One of the hikers had a Garmin GPS – it showed 3.8 miles and 2200 feet elevation gain. Holy smokes – no wonder I was tired! The trip back down seemed slightly easier, although (for me, anyway). Sure was glad to see our truck in the distant parking lot. Several of us on the hike had plans for a 50 mile bike ride on Tuesday, with the promise of lots of hills. Great…. 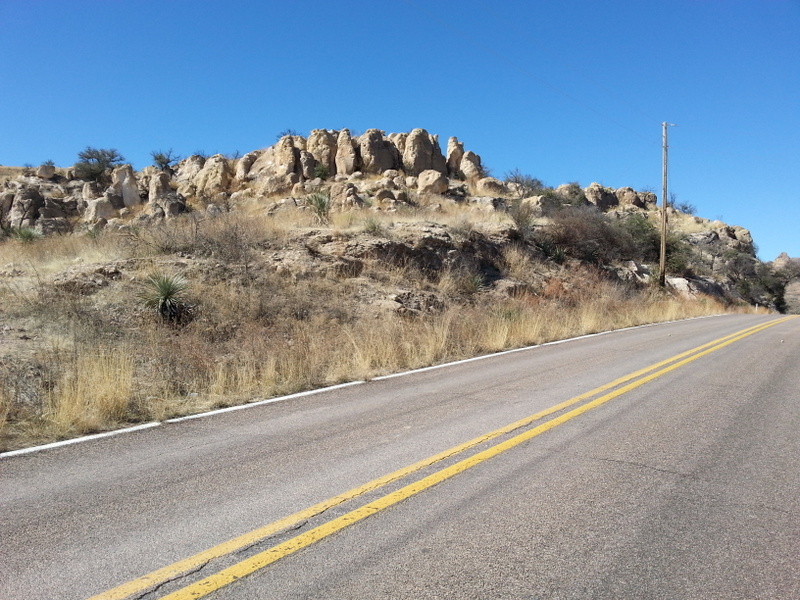 It’s tough to get out of bed Tuesday morning, but things seem to loosen up a bit by the time we head off on our ride – destination Pena Blanca State Park, just a mile off the Border west of Nogales. We started from Wisdom’s (see post entitled Margaritaville), so we knew the post-ride treat would be worthy of our efforts. We had an excellent ride – encompassing all the delights we don’t have in Michigan. 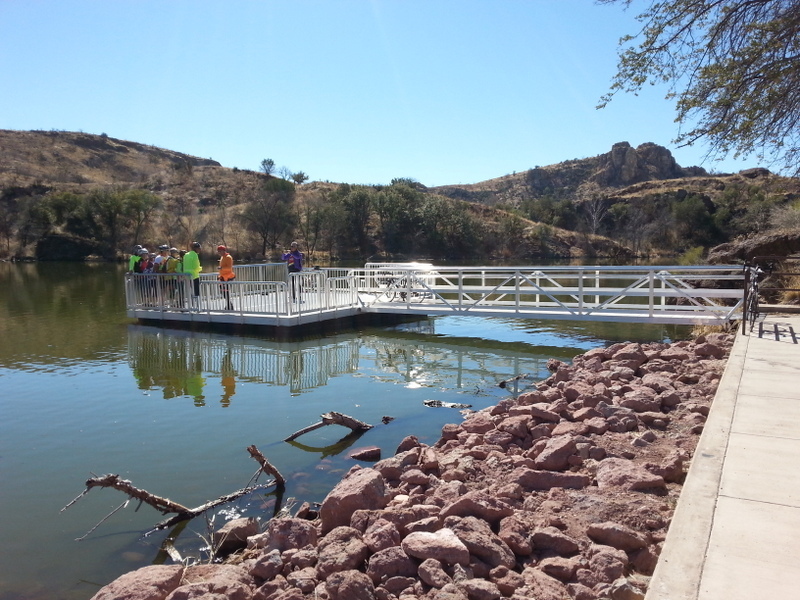 Riding on the Interstate, a long gradual climb to the park, then three steep hills through the canyon to the lake. Fabulous. wind erosion makes unusual formations in the rocks. Destination! Now, we just have to climb back out of here. Weather is starting to warm up – we’re hoping for near 70 degrees today. Our pipes froze again last night – third night in a row. Sooner or later, the weather has just got to give. Right, Michigan? 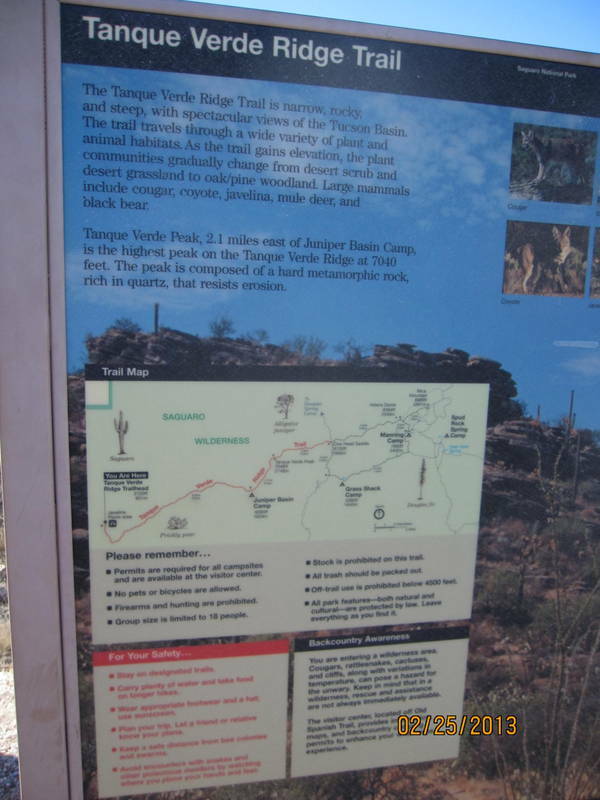 This entry was posted in Arizona, cycling, hiking, national parks, retirement and tagged Arizona, cycling, hiking, historic sites, national parks by Judy Crankshaw. Bookmark the permalink. Sooner or later, the weather has just got to give. Right, Michigan?…Not necessarily!!! signed, Michigan. Sounds wonder – full. At the rate we’re going here, you’ll probably be coming back to snow. It just won’t quit. Last year spoiled me. Your pictures look professional – so beautiful. Getting photos into the blog is my biggest challenge. Hope I get better as we go along. Sometimes, there’s just too much sunshine to get good shots (sorry to complain about that, Alison).